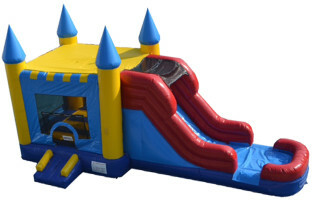 A royal gathering calls for an exquisite castle, and our combo bounce house castle is the right inflatable for the occasion. With sky piercing spires and an escape hatch to the moat, the princes and princesses at the party are sure to have a ball. This inflatable can also be used dry or wet, giving it fantastic versatility based on the day's weather.